Coming into this episode from last week, the big question that everyone wants answered is: “Will Arya survive?” Or will the Waif succeed in killing her? It’s easy to assume that Arya isn’t in real danger. After all, she is everyone’s second or third favorite character – at least according to most polls. But, this is Game of Thrones – and as we know from Lady, Ned, Catelyn, Robb, Hodor, Summer, Osha and many others, anything can happen. Tonight’s episode leaves the Arya survival question wide open. But, it answers another big question: Did the Hound live or die after Arya abandoned him? In the “Broken Man,” we catch up with Theon and Yara at a brothel; they safely escaped Euron – for now. Margaery is desperately trying to get her brother freed and save her family. Cersei may have made a fateful choice. Jon and Sansa try to build their army. And, Jaime and Bronn arrive in Riverrun. The queen isn’t truly free yet. Unella watches over Margaery. © HBO. Margaery still appears to be stuck in some kind of mind-control/Stockholm syndrome. However, she appears to be somewhat free again. She now wears a simple modest wool gown and her crown. So far, it’s been unclear whether cagey Margaery’s religious awakening is real or pretend. When the sequence begins, Margaery is receiving counsel from the High Sparrow. She admits to him that for years she pretended to love the poor. Then, in a fabulous show of church/crown collusion, the High Sparrow urges Margaery to perform her wifely duties and sleep with Tommen. After all, as the High Sparrow puts it, “Congress doesn’t require desire on the woman’s part, only patience.” Where are Ramsay’s dogs when you need them? The High Sparrow wants to consolidate Tommen’s rule now that he is under his thumb. This means that Tommen needs an heir. Historic note: As Richard III, Edward IV, Henry VIII, Henry VI, and a whole bunch of other kings could tell you, medieval kings were very insecure – and apt to murdered and overthrown – if they didn’t have a male heir. Richard III lost his crown after his son died. The birth of Edward IV’s first son in 1470 helped save his rule. After Henry VII’s first son Arthur died, Henry VII guarded his only remaining son (the future Henry VIII) as though he was a life insurance policy. Later, Margaery meets with her grandmother in her solar, as Septa Unella looms in the background, listening to every word. Margaery tells Olenna that the gods could have punished her for marching on the Great Sept, but they showed mercy. Margaery (Natalie Dormer) embraces her grandmother (Dianna Rigg). © HBO. Olenna can’t understand why her granddaughter remains so absurdly brainwashed. Worse, the High Sparrow still has her grandson and heir imprisoned. Margaery informs her grandmother that Loras’ only hope is to confess his crimes and repent. If he does, the Faith will allow him to return to High Garden. The catch: Loras will have to renounce his name, title, inheritance, and live as a penitent! Obviously, this isn’t even remotely acceptable to Olenna. Without Loras, her House and legacy faces destruction. But, Margaery is desperately trying to save her family. Olenna urges Margaery to leave for High Garden immediately. Margaery refuses on the grounds that she is the queen, and it is her duty to serve her husband. Ugh. We all know what the High Sparrow thinks that means. Margaery then kneels before her grandmother and encourages (read: warns) her to go home. She grasps her grandmother’s hand and slips her a note. Once Olenna is outside the solar, she opens the note. It has a rose drawn on it. The real message: Margaery is still true to her house but careful enough not to put it in written words. Later Cersei pays Olenna a visit – and finds the Queen of Thornes writing a letter. Olenna barely looks up from the letter, ironically mirroring the time Olenna asked for Cersei’s help and Cersei did the same. Nonetheless the Queen of Thorns really socks it to Cersei: “Loras rots in a cell because of you. The High Sparrow rules this city because of you. Our two ancient houses face collapse because of you and your stupidity.” It’s brilliant – and about time. Smart people have been telling Cersei for years that she overestimates her intelligence, but she refused to listen. (Well, in her defense, who does listen when they’re told they are dumb?) But still, some of the smartest people you know warn you that you aren’t as smart as you think you are, shouldn’t you at least solicit your counselors’ advice like every other ruler in Westeros and Essos does? Cersei points out that Olenna and Cersei need each other. This may be true. But, Olenna doesn’t let Cersei off the hook, nor should she. The Queen of Thorns Olenna muses that Cersei might be “the worst person” she’s ever met. Olenna informs Cersei that she is leaving so she isn’t thrown into a cell at the Sept by that “shoeless zealot.” She recommends that Cersei does the same. Cersei refuses to leave. She won’t abandon her son. But, Olenna reminds her she has lost already. Cersei has no support. The smallfolk hate her. Her brother is gone. Cersei’s surrounded by thousands of enemies. Olenna is giving her good advice. Yet, Cersei has a terrible history of not listening to wise counsel. Will she this time? As Olenna returns to writing her letter, barely giving Cersei a second glance, tears well up in the dowager queen’s eyes. How much Cersei has changed from the brittle little girl who went to see Maggy the Frog. If there is one thing that’s true in Cersei’s character, it’s that she really loves her children. In this scene, the newly humbled, shorn Cersei actually has the moral high ground. She’s repentant – and unlike the survivalist Olenna, Cersei is willing to risk her life rather than abandon her son. The episode tonight opened with a very un-Game of Thrones image of a community of smallfolk building a sept in a sun-dappled field. The menfolk haul logs, smelt nails, and chop wood. The womenfolk chop turnips and toss them into wooden bowls. It’s all very kumbaya and Whole Foods and beautifully natural. There’s even folksy guitar music – or maybe that’s a folksy harpsichord. The Hound (aka Sandor Clegane) is alive. He did not die from his infected bite. Sandor Clegane is portrayed by Rory McCann. © HBO, Helen Sloan. But, amidst all this strangeness, comes the big reveal: Sandor Clegane (aka the Hound) is BACK! He liveth yet. When we last saw Sandor, at the end of Season 4, he had been bitten on the neck by “Biter” (a mute criminal from King’s Landing) – who hoped to collect the ransom on Sandor’s head. Naturally, this human bite became infected. And then Brienne and Sandor fought when Brienne tried to get Arya to go with her. In tonight’s episode, it seems the septon of this folksy religious community found Sandor and healed him. Sandor now happily lives with these good people, chopping wood in regular peasant clothes. Not a twinkle of armor in sight. Sure, some men fear him. But, Sandor is trying to redeem himself by living a non-violent lifestyle. Sandor is still very much the realistic pragmatist. After three worshippers of R’hllor from the Brotherhood ride up to the community to ask for “protection money,” Sandor warns the leader that refusing them was a mistake. They will be back. He urges the leader to prepare to fight. A while later, as Sandor chops wood a few miles away, he hears screams as the Brotherhood massacres his community. Sandor runs back to the community to find everyone slaughtered and the leader dangling from a rope on the sept. Infuriated by the injustice meted out to the only people in his life who showed him kindness, Sandor grabs his axe off the chopping block. The old Hound is back and he wants revenge. Historical notes: Protection money and racketeering were alive and well in the middle ages. One example is the extortion that went on in the Anarchy when knights held entire villages for ransom. It was not unheard of for knights to join religious orders and renounce violence. Riverrun is Catelyn Tully’s ancestral castle. © HBO. The Freys may be wily. But military strategists they ain’t. Jaime and his army easily move in behind the Frey army, without any challenges. The Freys didn’t secure the perimeter around the siege. Jaime then blithley informs the Freys that he will be assuming command of the siege. Jaime wants a parley — that is, a chance to negotiate peace — with the Blackfish. Brynden “Blackfish” Tully (Clive Russell) at Riverrun. ©HBO, image: Helen Sloan. The parley does not go well for Jaime. Jaime is in a terrible negotiating position. In negotiations, there’s something called BATNA (Best Alternative to Negotiated Agreement). The long and short of it is, you can’t drive somebody to an agreement if you’re in a weak bargaining position, which Jaime is. The Blackfish is tough, smart, experienced, and stubborn. He knows who has the upper hand in this siege. Although in history there are some sieges that last for seven years and even twenty years, no commander wants to put a castle under siege for that long. Food runs out. The men get dysentery. The besieging warriors die most inglorious deaths. Jamie confronts a hero. © HBO. The Blackfish points out that if Jaime can even breach the walls, only hundreds of the Blackfish’s men will die whereas Jaime will lose thousands. Plus, why should the Blackfish trust Jaime would honor the agreed upon terms of surrender? Jaime’s not trustworthy – he’s the kingslayer and oathbreaker. And, Jaime’s family betrayed the Tullys at the Red Wedding during which the Lannisters and Freys colluded to butcher the Blackfish’s sister, nephew and men. Last week’s episode ended with Arya in danger from the Waif. When she tucked Needle into bed with her, it was pretty easy to imagine the Waif attacking her that night. Arya (Maisie Williams) hatches a plan to survive the Waif. © HBO. Arya’s not stupid. She knows she needs to get outta Dodge – and ideally as far away as possible – if she wants to survive. She has a plan, and apparently some gold. Arya wants to book a passage home to Westeros. She wanders through a tavern where she finds a captain dining with another man. She throws down loads of gold and books a private cabin for herself, leaving that night. Afterward, she pauses on a bridge to stare triumphantly at the Titan of Braavos. But, then it is a scene straight out of Cinderella. A kindly crone approaches her, “Sweet girl.” It’s the Waif. She stabs Arya in the gut multiple times. Arya ducks and rolls off the bridge where she tumbles into the water. The Waif saw the bloody cloud in the water and may assume Arya is dead. A few moments later, Arya emerges from the canal. Blood is gushing out of her abdomen. She staggers into the market square. It will be a miracle if she lives and makes it on that ship before bleeding out. The North sequence opens as the Free Folk chieftains debate whether to fight for Jon Snow and Sansa against Ramsay, who has basically declared war. The chieftains are far from convinced they want to do this. They agreed to fight white walkers – not get involved in “southern” dynastic politics. Tormund gives a rousing speech. He reminds the chieftains of how few people are left from Mance’s united army. If the Free Folk loose, their ancestors’ legacies will be extinguished. It will be like they never existed at all. Jon implores them to help him fight Ramsay and his vassals: “After they finish with me, they will come for you.” Plus, as Jon points out, the Free Folk need a united North – who can fight with one goal — if they want to stand a chance against the Army of the Dead. Tormund reminds them that Jon risked his neck to save their lives at Hard Home and then literally died for them. They have to fight together to survive. Wun Wun stands up says “Snow” and leaves. The others follow suit. The chieftains will support them. The note the baby bear sent to King Stannis. © HBO. It takes guts to stand up to a king like that — especially when you are a child. But, this little bear doesn’t make it easy for them. The pragmatic Lady Lyanna tells the trio to get to the point and cut the small talk. Bella Ramsey gives an awesome performance as the granddaughter of the late commander of the Night’s Watch. © HBO. “Why should I sacrifice one more Mormont life for somebody else’s war?” she asks Jon & company. A divided north won’t stand a chance against the Night King. The punchline: House Mormont can only give 62 men. Sansa (Sophie Turner) and Jon Snow (Kit Harrington) beg for House Glover’s support. © HBO. The trip to see House Glover doesn’t go well. Robett Glover isn’t happy with the late Robb’s leadership. He slags Robb for “taking up with a foreign whore” and “getting himself and his followers killed” as a result. And, quite frankly, you can’t blame him. Why should people risk their lives and families when their leader can’t even sacrifice a bit of personal comfort (choice of spouse)? Philippa Gregory: Take note. Robett only agreed to talk to Sansa, Jon and Davos out of loyalty to Ned. Plus if Ramsay knew he was even talking to them, he would literally skin Robett alive. Once Robett heard that the bulk of the trio’s forces were Wildlings, there was no way he would join them. Yara & Theon successfully escape from Euron and are at a brothel. While Yara gets it on with one of the prostitutes, Theon squirms nearby. It’s a painful memory of his former ability to perform sexually. Yara gives him drink therapy. She tells him she needs him to be brave. Theon is acutely aware of all the bad he has done. He says his head deserves to be on a spike. Yara tells Theon they will get revenge on Ramsay if that will help Theon restore himself. Then she announces the plan: she is going to get Daenerys to support them. The Broken Man in this episode could be Theon, who is broken and needs to find redemption. It could be Jaime whose identity has always been so deeply rooted in his martial prowess — will he restore his faith in himself at the walls of Riverrun? It could also be Cersei who seems to have genuinely changed. And, Arya body is now physically broken. Will she survive? I think the broken man was the Hound. He has taken up his sword again, or at least an axe. But a part of Arya seems to have rubbed off on him. This time he believes in justice. The brotherhood has clearly lost its way since we saw them last. They are no longer a force protecting the villagers against the Lannister oppressors, they are the oppressors. And it looks like Arya is headed back in that direction if she can find someone who can heal her wound. I rather doubt she will make the ship. And there will probably be a reckoning with the waif before she leaves. But is that part of Arya justice or revenge? I think there is a fine line. I think Arya has been consumed by revenge for the last few years and gone to a really dark place. But, you could also say that revenge is integrally intertwined with justice. Thoughts? I think that was the point of the play scene. Arya is not a Faceless Man. But nor is she an angel of vengeance, not any more. Before Arya, the Hound wouldn’t have cared about the brotherhood without banners running a protection racket (if it really is them). But now his sense of justice has been offended. He has a sense of justice to be offended. I do find the parallel between Sandor Clegane and Arya interesting. Both characters are so wounded and full of hate and anger, and are also most vulnerable. Looks like the Waif is in trouble herself. She was told to ‘make it quick’. But she failed at that part and she also failed to get the face. Which Suggests that Jaq’un won’t be impressed at her efforts. I doubt Arya is going to make the ship tonight. But she is dead as far as the faceless men are concerned which gives her some security. Keeping the appointment would be a mistake as Jaq’un would surely check to see if she was there knowing that the Waif may have failed. So right now, Arya’s best move is to lay low, get treatment for the stab wound and slit the Waif’s throat before she leaves Braavos for good. She kept the bonus money for the passage. She can get another ship. You know I almost thought it was a liver wound or something when I saw her bleeding out. But, I guess abdominal wounds bleed a lot? So does a sac of blood. There were several points of Arya’s plan that were very un-Arya-ish. Demanding a cabin for a start. Holding the whole negotiation out in the open. Not having needle with her. I think the Waif is going to be following Arya and then getting a serving of stabby stabby for herself. Arya plus needle against an overconfident Waif come to gloat after mortally wounding her quarry sound like good odds to me. I could be wrong but I suspect that the test Arya faced might involve a twist that involved Waif. Perhaps the real test was between these two- and who ultimately prevailed. All this might have been predicted by Jaquen & have been part of her training. It’d all be very “Star Wars” if this was so. I can’t add to anything you’ve said in this except my own small historical comparison. It made me think of ( as ever! LOL) The Wars of The Roses and historical figures like Francis Lovell and John, Earl of Lincoln who refused to let the war be over, even after Bosworth in 1485. If you ever get a chance to watch the 2003 BBC version of “The Mayor of Casterbridge” Clive Russell plays the seaman, Elizabeth-Jane’s real father. In the same film Ciaran Hinds (Mance) plays Thomas Henchard, Jodhi (Maggi the Frog) May plays Elizabeth-Jane and David Bradley (Walder Frey) plays Councillor Vatt. Off-topic there is a new version of “Whiskey Galore” coming out and the Old Bear and Meera actors are in that. BBC children’s TV is going to show (but I don’t think it’s on till next year and although the story has been dramatised before I’ve quite forgotten it) “Worst Witch” next year and the actress playing young lady Mormont will be in that. I think Anonymous is right that the Hound was the principal Broken Man and that as Jamie noted in her feature there were other characters that could be referred to as “broken” albeit some of them are female. In the 100 Years War a well-known battle where the English defeated the French with a smaller force was the Battle of Agincourt. The victory may not have been down simply to the English being better fighters though http://www.telegraph.co.uk/news/8648068/Battle-of-Agincourt-ten-reasons-why-the-French-lost.html – among other things it seems the French wore very heavy armour which impeded them when fighting. Asha is definitely heterosexual (unless GRRM reveals in WOW that she’s bisexual). I usually cut D&D a fair amount of slack in adaptation but I’m not keen on change for the sake of change. And the dialogue about “f***ing the t*ts off” the prostitute seemed a bit like “Ma’s out, Pa’s out – let’s talk rude” – or am I the only person old enough to remember that song? But then book Waif is very different to show Waif and Jaq’en is not even at the House of Black and White in the books. Where Davos speaks about “the dead are coming” I had a thought. In ASOIAF the wars between various houses pale into insignificance against the threat of the White Walkers. GRRM is not so very much older than I am and during my childhood and adolescence there was a lot of talk about the threat of nuclear war. I wonder if GRRM ever thought about the risk of a nuclear war but I could be quite wrong. The groundwork is being laid for a final showdown against the Boltons, the Lannisters and the Walkers. Yara & Theon have common ground with the Starks against the Boltons and Jorah’s house has deep ties with the Starks. I think Dany and the Starks will eventually join forces. Having re-watched some episodes of GoT, I love the way the show has mastered the art of foreshadowing and parallels. In S4 for example, Olenna Tyrrell remarks to Sansa, how shocking the murder of a man at his own wedding is. Of course, Robb didn’t die at his own wedding – he was attending someone else’s. The statement was foreshadowing Joffrey’s death. The parallels were evident again this week. The High Sparrow’s conversation about learned men being unholy because they do not possess the mother’s mercy directly followed the scene with Sandor and a Septon. 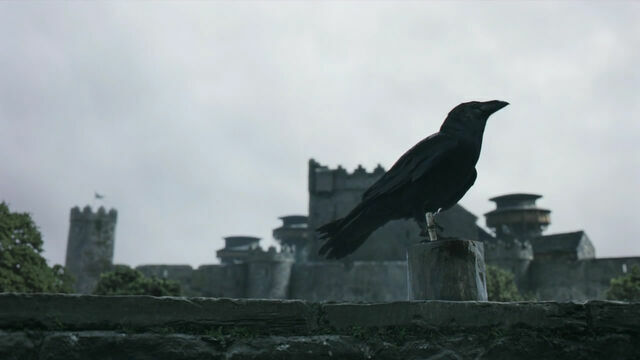 I think the show might be trying to tell us that the Septon is ultimately good, whereas the Sparrow has other agendas. (Incidentally, I wonder if the Sparrow is a representation of some of our religious history, ie. the Inquisition or the Reformation). Also, the relationship between Yara and Theon seemed to reflect Jon and Sansa’s. During Cersei and Olenna’s conversation, it was intimated that Cersei would do anything to protect her children. Like the fire foreboding, I think this is a recurrent theme hinting at possible future events. The dispute between the king/queen and the church recalls Henry VIII versus the Catholic Church. Of course the cause is not quite the same, but this tension is similar, especially if we consider how the faith of the Seven is directly based on Catholicism. Before Henry VIII there was also King John who tried to keep Vatican out of England. He failed. (I only know this from watching the Shakespearean play. Not sure how true to history it was.) John failed but Henry VIII won. I read a “sensible” (well it seemed sensible to me though I can’t remember its name) history book in the 1990s which said that at one time (this would be in the ‘Dark Ages’ or very early middle ages, before the first millennium anyway and therefore pre-dating the reformation) that members of the Church in England was concerned about the Church in Ireland practising in a way that was considered too far removed dictated by Rome. Things certainly changed later. I think the Faith could be inspired by many historical events. The Vatican during the Borgias (as I do believe the Faith are corrupt, which we may discover in time) and also Irish Priests & nuns during the 50s who invented the infamous Magdalene houses & focused on “atonement”. Did you ever see the film “Magdalen Sisters” with, among others, the late Geraldine McEwan as a really evil Reverend Mother and Norah-Jane Noone and Anne-Marie Duff? That didn’t show the Magdalen sisters in a favourable light at all though the three girls whose stories were followed were able to escape eventually (well the brother of one [who had been too young to do anything when she was taken away] had collected references of her good character to procure her freedom – the other two had to run away). There is also a film “Philomena” made more recently about a woman tracing her first-born who had been taken away because she was unmarried when she gave birth (sadly he was already dead when she found out where he had been taken). The film was a bit different to what actually happened but it starred, among others, Dame Judy Dench, Steve Coogan and had Michelle Fairley in a lesser part – a lot less sympathetic character than Cat Stark. I think the Faith may not be corrupt in a wordly sense but may be like the Jansenist nuns in the convent of Port Royale in Paris circa the 1660s. The then Bishop of Paris is said to have described the nuns as “pure as angels but proud as devils”. That could fit Septa Unella. Watcher, that’s a very profound assessment of Septa Unella. I can’t remember whether or not I’ve seen The Magdalene Sisters. It was a hugely celebrated film in Canada when it came out — by independent film standards. But I seem to remember it looked like biting on tinfoil… like you would cringe to sit there and see it. re: your proud as devils comment Do you think the Faith are fueled by pride? I’ve always assumed they have been caught up in their brainwashed sense of belonging. But you may be on to something. Do you think the High Sparrow is the same way? Truly corrupted by pride and ego underneath it all? Yes I have watched the film. Those nuns’ obsession with punishing women (although boys were mistreated by Priests too) for “mortal sins” reminds me very much of Septa Unella. Like those in the film, Unella is not averse to physical cruelty either. To add to my comment (I can’t write long ones due to scripts on my phone), the Faith may not be corrupt but as Jaime Lannister has pointed out, they are hypocritical – Cersei has “atoned” but he has not been tried for being a Kingslayer for instance. I re-watched this episode at the weekend and something struck me. The Hound’s friend implies that all the Gods may be one and the same. Interestingly, Davos said something similar in ep. 2. Knowing how GRRM loves foreshadowing, I wonder what this may be trying to tell us or imply? The Faith certainly seem to have a one-track attitude in that they think their way is correct and don’t entertain the notion that other people could be acting differently to them for decent motives. Part of me was glad when Cersei was foisted on her own petard because she had done the dirty on so many people but I would have devised a different punishment than a walk of shame – what about community work with the unwashed of Fleabottom, I bet she’d have loved that! I think the Faith are proud in a bad way in that they are so sure they are the only ones who are right. I agree. In one sense, I did not pity her because she is a genuinely bad and immoral character but I disliked the way they seemed to revel in her misery. To me, it wasn’t justice. Justice might be a swift execution or a lifelong prison sentence, not gratuitous punishment.